A Timeless Treasure and Style Classic, our rings are always fit for any occasion. Beautifully crafted and designed our Diamond ring is sure to win your way into her heart. This ring crafted in 10K Yellow Gold that adds a polished look to any ensemble and outfit. This ring is the perfect ring for engagements, weddings and all other occasions. As always with all of our products this item comes in packaging making it ready for gifting as soon as it is received.This beautiful item is brand new and comes with complimentary gift packaging appropriately selected to match the item you purchased. The packaging ranges from dainty foam insert packaging to luxurious leather insert cherry wood boxes. Every order is fully insured regardless of value. This insurance protects you against damage or the loss of your item while in transit. The Shipping and Handling fees include the insurance so there is no need to pay separately for insurance. 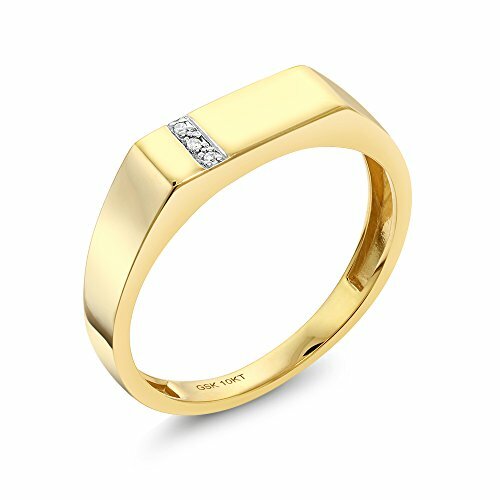 MADE OF REAL SOLID GENUINE 10K YELLOW GOLD - This Ring is made of solid 10K Yellow Gold, with 10k Stamp. This composition makes this ring extremely tough making it suitable for everyday use. Every piece passes rigorous inspection. So you can buy with confidence. MESMERIZING DESIGN - This design is Sleek and Modern yet Classic and Elegant Style. fit for any occasion as daily wearing home and office. Carefully packed in beautiful jewelry box. Absolutely a great gift to express your love. PERFECT - Gift for Fathers' Day, Graduation, Bachelor Party, Wedding, Anniversary and Daily Wear.